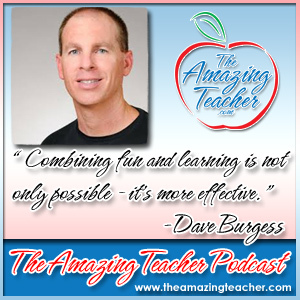 This week, my guest is Amazing Teacher, Dave Burgess. Dave Burgess is the author of the book, Teach Like a PIRATE: Increase Student Engagement, Boost Your Creativity, and Transform Your Life as an Educator. Dave shares on the podcast how teachers can create lesson plans that keep students engaged and learning. 1. If the the students didn’t have to be there, would you be teaching in an empty room? 2. Do you have any lessons that you can sell tickets for? Dave also encourages teachers to find creative ways to bring their passions into the classroom. Dave shares that amazing teachers have passion, always learning, connecting with other teachers and collaborating with them. He also states that amazing teachers have courage. They’re not afraid to try to new things and take risks. My conversation with Dave was truly inspiring, and I know you will find his insights inspiring as well.